ARE YOU PREPARED FOR NEXT SEASON? As the weather begins to warm up and the winter craziness begins to die down, you may think that it is no longer necessary to use an anti-gel in your heating oil tanks. It may seem obvious to use a stabilizer once the season ends and heating oil tanks go dormant. The threats of sludge, water, as well as degraded fuel are a few of the reasons as to treat your fuel with an additive in the off-season. Maintenance on your oil heating system is necessary to ensure a stable and responsive start up next winter. As for fuel, the switch to summer fuel does not keep you out the reach of the risks of today’s fuel. However, many forget that outdoor tanks still are at risk for gelling and freezing once the winter months begin again. All it takes is one cold night for a heating oil tank without an anti-gel additive to freeze and cause problems for you and your customers. That’s why Fuel Ox™ offers fuel treatments specific for the heating oil that keep your fuel stable and protected against the threats of sludge, water, as well as gelled or frozen heating oil! 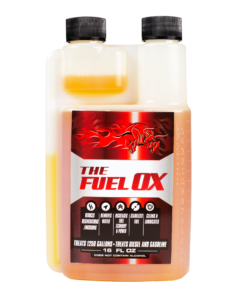 Our Fuel Ox Heating oil line consists of Fuel Ox H.O.T., Fuel Ox H.O.T. Cold Charge, and Fuel Ox H.O.T. Freeze Guard,Each additive is highly concentrated, with a 1:10,000 treatment ratio that makes dosing simple, and will safely separate the water in your fuel. Each product also contains a stabilizer that will keep fuel stable and usable for up to two years. As for gelled fuel, Fuel Ox H.O.T. Cold Charge and Fuel Ox H.O.T. Freeze Guard, contain an anti-gel that reduces the effects of water and wax by lowering the pour point of fuel. Fuel Ox H.O.T. Freeze Guard™ lowers pour point about 34°F. Fuel Ox H.O.T. Cold Charge™ lowers pour point about 22°F. Each product also contains lubricants and detergents that clean the fuel system out and keep it running smoothly and efficiently. Bottom line: regardless of if you use our products or not, in order to get the best performance out of your fuel system and keep the quality of your diesel or your heating oil at an all time high, you must use an additive that protects against the threat of water, degraded fuel, and gelled fuel. It is the easiest and most cost effective way to keep customers happy, fuel systems running at peak performance, and keeping a good reputation for your business.